Saftey Panels or Safety Wings? Many of our customers ask us "What is the difference between your safety wings and safety panels?" - A good question and one that can certainly help to put parents minds at ease when it comes to the safety of their child in a new bed. As well as our furniture being periodically tested to applicable British and European Standards, we also provide parents peace of mind with the options to have panels or wings attached to the bed. 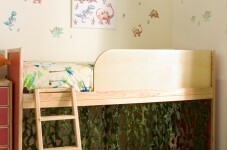 Its natural to be cautious when buying a high bed for your little one. Safety wings and panels are provided as standard with all of our high beds, however we know its peace of mind for parents to have extra safety barriers for little ones even on lower beds. Safety wings can be coloured to match either white or natural wood. Safety wings are panels that are placed on the footboard and headboard, leaving an access gap in the centre of the bed for a ladder. The wings can be removed at a later date when no longer needed, when the child is a little older. 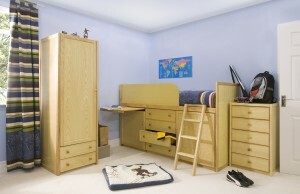 As with the safety wings, the safety panel can be coloured to match natural wood or white depending on the bed ordered. The safety panel sits at the headboard only, leaving a space at the foot board for a ladder. Once your little one is old enough, the panel can easily be removed. If you have any further questions regarding safety aspects of our beds, please do not hesitate to get in touch with our friendly CBC team.